After the destruction of his home and death of his family by a rogue U.S. military operation, Jonas leaves his unnamed Muslim country to start a new life in the United States. Only fifteen when he first moves, Jonas has a fair amount of anxiety stemming both from trying to adjust to living in a new place, and from what he went through in the time immediately after the attack. Mandated by his school to see a counselor, after beating up another boy who was giving him a hard time, Jonas begins to open up, although slowly. A story comes to light about a soldier, Christopher, who saved his life after the attack, a soldier who never made it home and whose body was never found. After Jonas spends time with Christopher’s mother, a woman who has created a support group for families of missing soldiers, the reality of what happened begins to fester inside him, until he cannot help but let it out. The story Dau is telling is particularly affecting. Interestingly, Jonas, the main character, is held at somewhat more a reserve than Christopher, whose words come to us only from a journal he left. Jonas is clearly damaged by what happened to him before he was brought to the United States as a refugee, it shows in his behavior both in high school and college and with his girlfriend. Christopher, too, was damaged by his time in the war. His journal shows a man who knows that much of what he has done is wrong, but can’t see that he might have acted any other way, due to the psychological pressures of dealing with an unhappy occupied populace. Their damage and experiences make their time together after the attack particularly unusual and poignant. 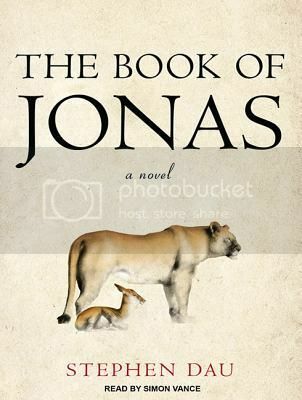 I tend to really enjoy Simon Vance’s narration, but I’m not entirely sure that The Book of Jonas was his best work. For one thing, he seemed to rush the story a bit, many sections would have been better served had he simply slowed down, and the American characters were not always easy to distinguish from one another. Of course, Vance being not at the top of his game is still much better than many narrators, but I did find his performance slightly disappointing because I felt that he could have done better. An additional hurdle for the audiobook listener is the addition of what I believe was Christopher’s journal woven throughout the story. Although Vance’s narration of Christopher’s point of view is easily recognized, it isn’t entirely clear for much of the book where this perspective is coming from, which may bother some (although certainly not all) listeners. This is definitely a book worth experiencing. 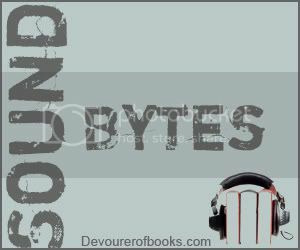 It may be a bit more challenging in audio than it is in print because of the challenges conveying some of the book’s structure orally, but it can definitely work either way. Simon Vance is such a good narrator… probably better than most even if it isn’t his best. Still, I might choose this one in print. I do love Simon Vance but I might try to get this in print. Well, for most of the book Jonas is actually college age, so that part works okay. The soldier is actually pretty good, but the American therapist really isn’t quite right. This does sound interesting, but I am sorry to hear that the narration wasn’t perfect. I have a lot of friends who love Vance and consider him a favorite narrator but perhaps this story just wasn’t suited to him. Very intriguing review today. The book seems like a very emotional and complex read. This is the 3rd time I’m seeing this book now! Sounds intriguing, but perhaps “easier” to read in paper? I think the story itself sounds so compelling that I’m going to have to enter the giveaway now.